There is a visceral disapproval to Donald Trump on the world stage. The US President gets people in emotional state. Whenever I meet friends the is a comment about his policy or what he says. The man in the White House is a piece of work, an entitled vestige of the upper one percent class who knows he is one of the most important presence in the room. Europeans look over the Atlantic with feelings of fear and moral superiority. Oh,,,,denial is lifestyle until reality hits the face. When I first came to Europe there was a sense of optimism. The false sense of European Identity was everywhere. Nationalism at look last was dead. The EU economies were moving forward in the time of prosperity and open borders and soon a single currency. Pax Europa had arrived with Brussels as the capital. 2018, Europe is in crisis with the political class clinging to power by all its finger nails. The political class reacts more out of desperation than inspiration. Greece has been beaten into economic 3rdworld submission by Euro Champions. Immigration is testing even the most liberal societies. Right Wing movements have slowed, but not stopped. The United Kingdom will leave the EU in one form or another in 2019 if the politicians can stop jockeying out of self interests. May has proven to be a constant humiliated character held with low regard by all. Brexit could have been avoided had pragmatism with imagination been used with a bit of humility. But instead Barnier, Tusk, Juncker, and the Euro Politicians decided on punishment, to show the other countries in the club, “don’t get any ideas”. Reference popular uprisings in Eastern Europe, Eurocrats could soon learn what the Soviets discovered in 1989. The system did not fall because the Communist were tired of ruling. Today, at the time of writing France is gripped by riots that could manifest into full scale civil war. The genie is out of the bottle. Pent up rage has once again exploded on the French streets. When I am in Paris, I marvel at the city, splendor, the charm, the stores, the romantic ideas. But underneath, I often wonder, how do people afford to live here? 8 euros for a cafe in the center, my morning Monster energy drink was 3 euros. I made that one can last for 3 days. Electing a former member of the financial circle as head of state then expecting sympathy is a bit naive or desperate. This is familiar to USA in 2016. Macron’s first legislative act, tax cuts for the wealthy, a few, followed by fuel tax hike, for everyone. Then the standard neoliberal economic phrase, “reform the economy”. This usually means the working class gets less, the corporate class gets more. Like his UK and Brussels elite counterparts, the ambitious leader wants to lead an “Enlighten Europe” with a view from the clouds, out of touch from the mere people who put him in office. Is there any wonder there are violent country wide protests? The Yellow Vest movement has spread to Belgium and The Netherlands. As I say, it is easier to look out the window than in the mirror. Europe has its high moral plateau made of wet cardboard. 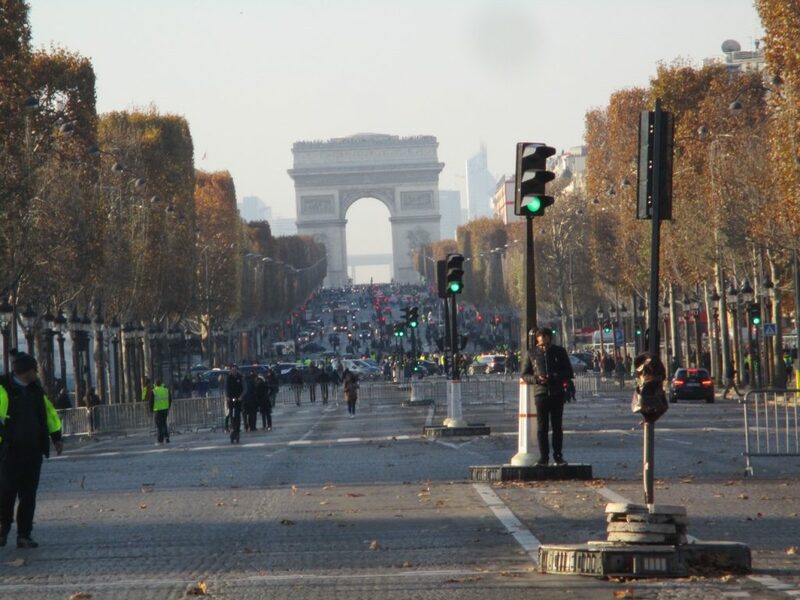 Separator image Posted in Feature and tagged with EU, Euro, Europe, France, Paris, politics, protest, yellow vest.